Increase The Beauty and value Of Your Home. Hardwood floors are striking and make a nice visual impact in your home. In addition, with the new, harder aluminum oxide-enhanced polyurethane finishes they are easier to maintain than ever. 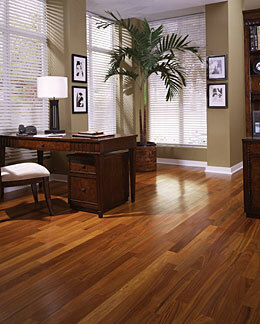 With hardwoods becoming more and more popular your choices are wider than ever, too. From traditional oak and maple floors to exotic hardwoods from Brazil and other countries to authentic Amish hand-scraped varieties, it’s easy to find a great floor for your home. Whether you have classic styling or a contemporary home, the right wood flooring will finish off the look for you. On top of all that, hardwood floors are a smart investment for your home, as hardwoods are seen as an upgrade to the building. So when the time comes to sell your home, you get a good return on your beautiful investment. Call or click today to set up a free no-obligation shop-at-home appointment with one of our design consultants. We’ll bring out hardwood samples to your home. Are you looking for more information on hardwoods? Read our “Hardwood 101” overview.